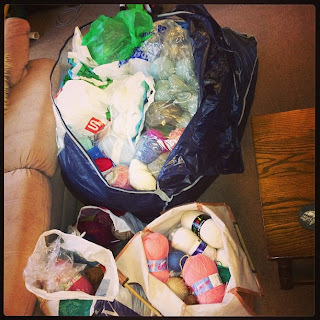 A few months ago I was given a huge stash of yarn that was found at my Nan's house. She is now 91 and can no longer knit or crochet, so my parents decided to remove it and give it to me. They didn't bank on the amount of wool that was there though.......it filled the entire car up!! So today, having given myself a day off study for being a good girl, I thought I would use some of it. 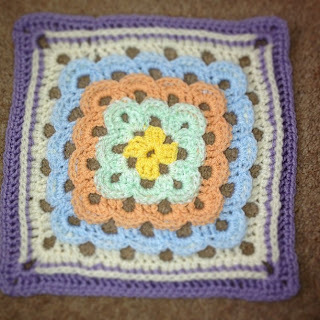 I had seen a rather nice square pattern that I thought I would give a go. I saw it on Ravelry; the 'yarn clouds square'. It is my Nan's 92nd birthday in a couple of months time, so I chose colours that she likes and set to work. It was very quick and easy once I got into the swing of it. I used DK yarn and a size 4mm hook; in fact I used my favourite wooden hook. Because I used DK and a smaller hook, the square measured only 8.5 " rather than the 12". I'm thinking that I will make another one and buy a cushion pad and some lavender essential oil and make a lavender scented cushion for her to put on her bed. It has been lovely being able to have a quick project after a long one with all my lounge cushions. So much for regular posts!